Flooding at Kent School on Jan. 24 after heavy rain fell. KENT — Route 7 in Kent finally reopened Monday afternoon after days of closure due to flooding from the Housatonic River. 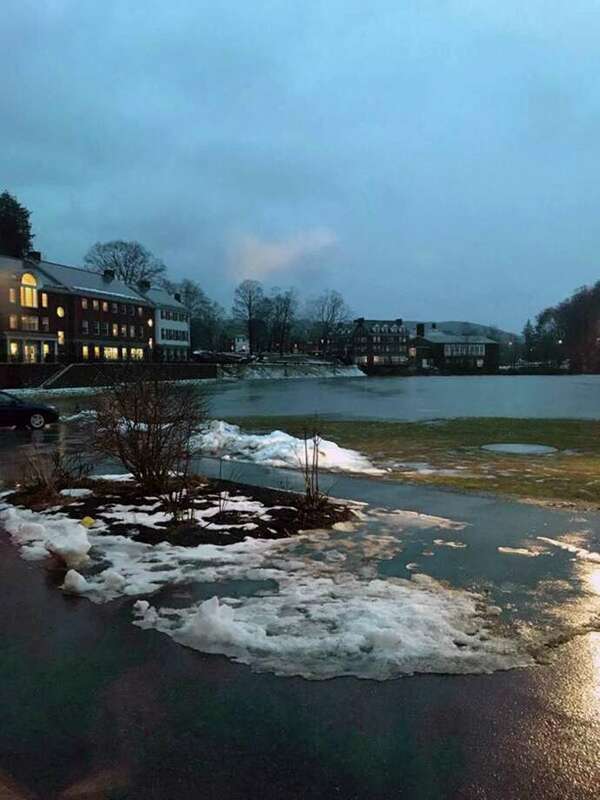 The flooding situation was not as severe as last winter, when an ice jam on the Housatonic River closed the road and Kent School for several days, forcing the evacuation of families and led the town to declare an emergency. But the Kent School, which saw flooding last week, closed Monday morning and was open by 12:40 p.m. Route 7 was open for traffic about 2:30 p.m.
Route 7 closed south of Route 341 late last week because of water flooding onto the road. “The extreme variables that we experienced last year, some that brought historic flooding and ice jamming, are not being seen right now,” Brian Ohler, a former state representative, said on social media. One Kent School student, 17-year-old Ally Thanassi, described how water quickly covered the private school’s fields Thursday afternoon. She estimated the water was as much as 3 feet deep as it swelled in a little over an hour. Ohler assisted the emergency team with last year’s ice jam. He described this year’s ice build-up as “moderate” just south of the “Double 90” section, where an ice jam reached nearly two miles long last year. Ohler, who said he had been in contact with the Kent Volunteer Fire Department, said Sunday morning the waters were expected to recede in the coming hours and days. “As always, please stay away from ice build up and floodwaters and yield to all direction and detour signs,” Ohler said on social media. Kent Volunteer Fire Department also urged drivers to follow detours and to not approach the ice jams. “They are extremely dangerous, unpredictable and full of debris,” the department said on Facebook.